This is a game from the old forums , where everyone just adds a little to each card and in the end we want a whole set. 1. At the end of this post, I will give the set a name. 2. The next three posts each choose one (non-evergreen) keyword (custom or official) that is featured in the set. 3. Then the real game begins: Each player posts one aspect (name, color, mana cost, type, abilities, p/t,...) of the current card until the card is finished. The next post will then start a new card. Flavour and card image are optional. You can only add one aspect per post and must wait at least two other posts before posting again. 3a. Clarification: You can add more card text to the current card if you feel it isn't finifhed yet. 5. Feel free to add lore at any time! The set will have 55 ; 45 ; 35 and 10 . Colors should be evenly distributed, (except for mythic rares maybe). This is a really cool idea! Correct me if I’m wrong, but since I’m one of the first commenters I get to choose one of the set’s mechanics. I choose Evolve, and I think we could have some cool non- creatures that put it to good use. Nice, excited to see where this thread will lead. Cards with proclaim have an effect that happens when you pay the proclaim cost. It's similar to Miracle but different enough to warrant its own name. Let's toss out a nice Evolve enabler... how about Tribute? I feel like some extra groundwork might be helpful. Might I suggest that evolve be mainly in , proclaim mainly in , and tribute mainly in ? Of course, we can go wherever the design takes us, but this framework may be useful. gluestick248: Sure. I'll put it in the set discription as a "non-binding suggestion"
Unless someone wants to add flavour text or an image, I'd say this card is finished. Alright, the next one costs . Question: Can we add more card text as these go along? Otherwise the proclaim doesn't "do" anything. Right? Or should the entire rules text be written in a single post? When you proclaim ~Card 2~ scry 3. 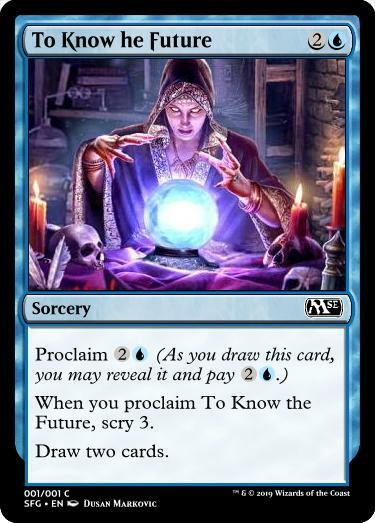 When you proclaim To Know the Future, scry 3. Guess we're done with this card as well, no? I'm back from vacation! I added the clarification that you can add more text to a card. And I took the liberty of using the miracle fraim for proclaim. If you insist, I'll try better. Whenever one or more +1/+1 counters on put onto a permanent you control, you gain 1 life. Whenever one or more +1/+1 counters are put onto a permanent you control, you gain 1 life. : The next time you would draw a card this turn, put a +1/+1 counter on target creature instead.